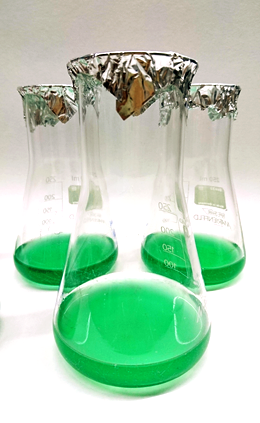 Blue-green algae may look simple, but their photosynthetic apparatus certainly isn’t. Its mode of assembly remains puzzling, but the loss of a small protein, variants of which are found in higher plants, clearly causes a lot to go wrong. Green plants are not the only organisms that possess the ability to harvest solar energy to power their metabolism. In fact, evolution had endowed unicellular green and blue-green algae with the capacity for photosynthesis long before multicellular plants appeared on the scene. The essential steps in photosynthesis are carried out by macromolecular complexes consisting of multiple pigments and proteins, which are embedded in specialized intracellular membranes called thylakoids, whose composition and arrangement varies between the major groups of photosynthetic organisms. The fabrication of these complexes is akin to the process of piecing together a jigsaw puzzle, some of whose parts have not yet been located. Researchers led by Jörg Nickelsen, Professor of Molecular Plant Sciences at the LMU, have now identified and placed one of the missing pieces. Nickelsen and his colleagues are studying the biogenesis of the thylakoid membrane in Synechocystis 6803, which serves as a model for the molecular and cell biology of blue-green algae (otherwise known as cyanobacteria). Among other things, they are interested in the function of a comparatively small protein called CurT, which – it now turns out – is essential for correct assembly of the thylakoids in cyanobacteria. In a paper which has just been published in the leading plant journal The Plant Cell, they show that CurT plays a crucial role for the early phase of the intricate and highly regulated process of thylakoid biogenesis. The membrane sheets that constitute the thylakoids of blue-green algae veer close to the inner face of the plasma membrane at several points around the circumference of the cell. It turns out that these sites act as “biogenesis centers”, as doctoral student Steffen Heinz, first author on the new paper, explains. The first steps in the assembly of what is called Photosystem II (PSII) take place at these regions. PSII is the protein-pigment complex responsible for the first stage of the process that converts radiant into chemical energy. CurT is found in high concentrations in biogenesis centers, and may play a part in specifying the characteristically curved structure of the thylakoid membrane at these sites. In mutants that lack CurT, biogenesis centers fail to form and the normal organization of the thylakoids is severely disrupted, as Heinz and his co-authors demonstrate. Moreover, levels – and hence the photosynthetic performance – of PSII are significantly reduced. In addition, the mutants are abnormally sensitive to osmotic stress. Heinz points out that these defects suggest that CurT acts to stabilize the thylakoid membranes, especially at the sites of biogenesis centers, which are required for proper assembly of PSII. Related versions of CurT have been identified in plants, such as Arabidopsis thaliana (the thale cress), a popular experimental model in plant sciences. Here too, these proteins alter the organization of the photosynthetic membranes in a specific way. In particular, they are involved in the localized stacking of thylakoid membranes to form so-called grana. Although photosynthetic bacteria actually lack grana, the presence of CurT proteins in both Synechocystis and plant cells is compatible with the unusual evolutionary history of the latter. In plants, photosynthesis takes place in specialized intracellular compartments called chloroplasts – and compelling evidence suggests that these organelles derive from free-living cyanobacteria that invaded nucleated cells and established themselves as so-called endosymbionts. Over the course of evolution, the symbionts were gradually transformed into the chloroplasts found in leaf cells of higher plants, where CurT-like proteins now mediate the localized stacking of thylakoids.